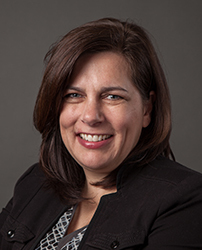 Julie Reed Kochanek is director of the Regional Educational Laboratory (REL) Midwest, and a managing director and director of the local, regional, state, and national education systems practice area at AIR. Dr. Kochanek has more than 15 years of experience in research and evaluation of school reform efforts, with a special focus on the social and organizational conditions surrounding schools and districts. Her current work explores methods to bridge research and practice in education. Dr. Kochanek recently concluded a William T. Grant Foundation-sponsored study of knowledge utilization in district decision-making. In her current role on REL Midwest and her previous role as the director of research for REL Northeast & Islands, she has designed and implemented structures and procedures that engage stakeholders in the research process, facilitate conversations between researchers and practitioners throughout a project life cycle, and entail the inclusion of activities that support stakeholders in the use of findings. As part of this work, she developed tools to guide a process for developing a long-term research agenda and assisted state and local education agencies in partnering with researchers to better serve the agency’s interests. In addition, she has designed and conducted studies of collaborative research models including a study of variation in research alliance formation and a study of changes in researcher attitudes and behaviors when engaged in collaborative research. Dr. Kochanek is experienced in project management and quality assurance. Through her leadership of the federally funded REL Midwest, she directs a team of researchers in developing and conducting rigorous and relevant research to advance the research agendas of eight alliances of districts and states. Dr. Kochanek has served as principal investigator on several projects including the evaluation of TNTP’s i3-funded Teach Initiative, an evaluation of Indiana’s full-day kindergarten policy, and a study of parent involvement initiatives in school improvement plans. In addition to multiple studies published by IES, she is also author of Building Trust for Better Schools: Research-Based Practices and co-author of multiple chapters in Trust in Schools: A Core Resource for Improvement by Anthony Bryk and Barbara Schneider. Earlier in her career, Dr. Kochanek worked at the Consortium on Chicago School Research at the University of Chicago. She has completed formal training in meta-analysis from the Campbell Collaboration and in the design and implementation of randomized controlled trials from the Institute of Education Sciences Training Seminar.